Zion Market Research has published a new report titled “Aircraft Seating Market by Aircraft Type (Wide Body Aircraft, Narrow Body Aircraft, Very Large Aircraft, and Regional Transport Aircraft), by Seat Class (First Class, Business Class, Premium Economy, and Economy), and by Component (Seat Actuators, Foams & Fittings, and Others): Global Industry Perspective, Comprehensive Analysis and Forecast, 2016 – 2022”. 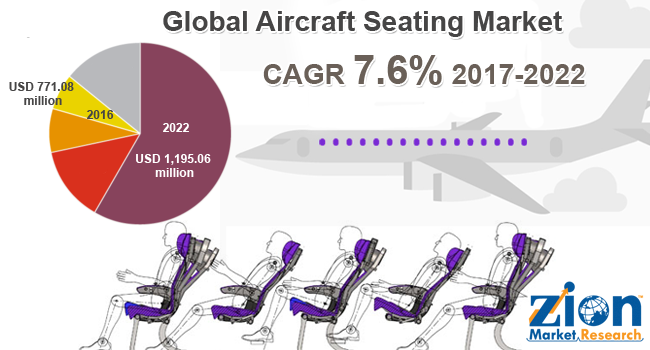 According to the report, the global aircraft seating market was valued at around USD 771.08 million in 2016 and is expected to reach approximately USD 1,195.06 million by 2022, growing at a CAGR of around 7.6% between 2017 and 2022. Aircraft seat actuation systems are used to providing comfortable seating for the passengers in commercial and private aircrafts. These seat actuation systems are automated and have the ability to let the passengers adjust their seating position as per their comfort level. The increasing disposable income is creating a demand for air travel globally. This demand is in return creating a demand for commercial aircrafts. The seat actuation systems are one of the essential components of aircraft cabins. Growing popularity for seat actuators is expected to bolster the growth of aircraft seating market across the globe. For instance, aircraft seat actuators market accounted for USD 625.87 Million in 2016 which is expected to increase to USD 978.70 Million with a CAGR of 7.8%. The ergonomic seat designs also help the pilots to operate the aircraft efficiently. In addition, the ergonomic seat designs include a skull and lower back support. Furthermore, the rising demand for premium air travel is also creating a demand for advanced seat actuation systems. On the basis of aircraft type, the aircraft seating market is segmented as wide-body aircraft, narrow body aircraft, very large aircraft, and regional transport aircraft. Among which wide-body aircraft segment is expected accounted for the major revenue share in the aircraft seating market over the forecast period. Narrow body aircraft and regional transport aircraft segments are followed by the wide-body aircraft segment in terms of revenue share. Among the aircraft type segment, the wide-body aircraft segment is expected to dominate the global aircraft seating market with 33.86% value share by 2022. However, aircraft seating market for narrow-body aircraft segment is gaining more importance in the market and is expected to grow with a relatively higher CAGR by 2022 over 2017. On the basis of seat class, aircraft seating is categorized into first class, business class, premium economy, and economy. Among the aforementioned segment, economy segment accounted for the relative revenue share in the aircraft seating market. The growth of business class segment is attributed to increasing working population and increasing per capita income. On the basis of the component, aircraft seating is categorized into seat actuators, foams & fittings, and others. Among all component segmentation, others segment accounted for the largest market share, followed by foams & fittings sweetener. However, seat actuators segment is expected to expand at a substantial growth rate, owing to increasing demand for aircraft seating with advanced actuators. On the basis of the region the aircraft seating market is segmented into, Asia Pacific, Europe, Middle East & Africa, North America, and Latin America. Among all the regions, Asia Pacific region dominates the aircraft seating market in 2016 followed by North America in terms of value. Some of the key players operating in the market include Zodiac Aerospace, B/E Aerospace, Inc., RECARO Aircraft Seating GmbH & Co. KG, Geven S.p.A., Aviointeriors S.p.A., Acro Aircraft Seating Ltd., Thompson Aero Seating Ltd., HAECO Americas LLC, ZIM FLUGSITZ, STELIA Aerospace S.A.S., etc. The key players focus on boosting their distribution network all over the globe in order to meet growing demand.